Selecting the right architect, builder and financing package for a custom home project can be stressful. For Tiffany and James, those challenges brought them closer together. It even brought them closer to Tiffany’s parents, who live next door. When it was time to select an architect, Tiffany and James had an easy decision: James’ father is a highly-respected architect, so they chose him. Throughout the process, her architect made suggestions, gave advice, and helped them realize their dreams, including suggesting they add a closet to the office. That way the house qualified as a three-bedroom home. “He’s spent his career doing remodels so he has a deep knowledge of the kinds of things people change later. His advice was proactive and fantastic,” Tiffany said. Next, they had to choose the right builder for their project. Tiffany and James decided to hire the same builder who worked on her parents’ home because they liked his work ethic and quality. ViJay Altergott, Construction Loan Advisor at Northwest Community Credit Union agrees, telling members to select seasoned, well-established, and reputable professionals. Some additional tips ViJay has include viewing the builder’s projects and talking with their current and former customers. “Consider their communication style to make sure it’s a good fit, because communication is key,” she says. If you need help selecting a builder, a good resource is the Oregon Construction Contractors Board Guide to Selecting and Working with a Contractor. 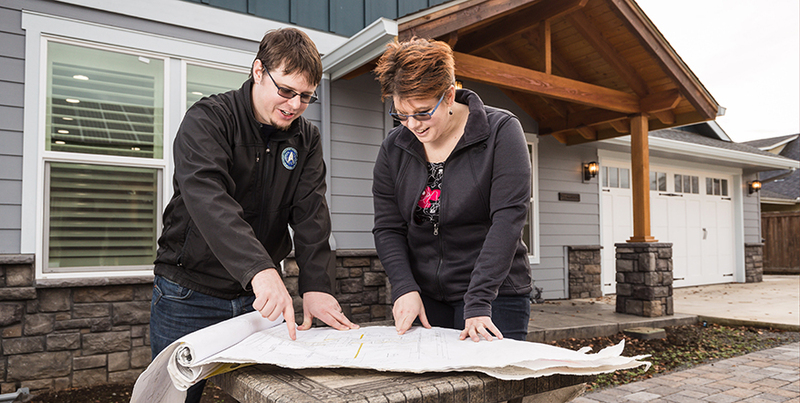 At the same time Tiffany and James were selecting their architect and builder, they sat down with their Northwest Community Credit Union construction loan advisor. At this stage, we’ll help you get pre-qualified for credit and if we haven’t previously worked with your builder, we’ll get them pre-approved, too. This is also a time to organize your documents to avoid delays later. “We encourage members to have their their financial records ready early in the process,” says ViJay. “This includes bank statements, tax records, and paystubs. It really helps move the application process along when financial information is organized and ready.” She adds that keeping a good paper trail of all your project information can be beneficial because it may be needed during the financing process. At Northwest Community Credit Union, we enjoy helping uncommon members like Tiffany and James build the home they’ve always wanted. We’re excited to help you with the home of your dreams, too. Whether you’re buying land and building your own home, or simply choosing a 30-year conventional mortgage, you can put our years of expertise to work for you, every step of the way. In our next blog, we’ll explore what Tiffany and James learned as construction began, learn budget-wise tips from our Construction Loan Advisor, and discuss what to expect as your custom home is being built.